This revolutionary concept is the Ultra Slender Power Trimaran (USPT). Initially, the project was mainly to find a boat to operate the Mauritius-Reunion route in the Indian Ocean, considering the importance of the air traffic between the two islands. However the research undertaken demonstrates the viability of this project for countless routes across the world, routes suffering similar swell conditions as the Indian Ocean route. Web Site Snapshot: If available, above is a snapshot of the Diogene Marine web site at http://www.diogenemarine.com as it appeared when this site was added to the directory or last verified. 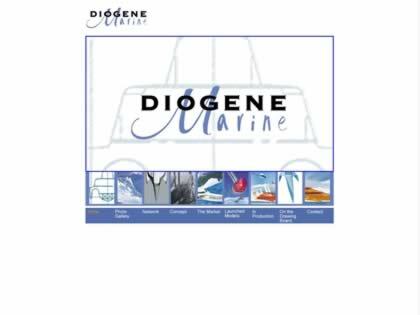 Please Note that Boat Design Net has no involvement with the above web site; all content and images depicted in the above thumbnail are the property and copyright of Diogene Marine unless otherwise noted on that site. Description: This revolutionary concept is the Ultra Slender Power Trimaran (USPT). Initially, the project was mainly to find a boat to operate the Mauritius-Reunion route in the Indian Ocean, considering the importance of the air traffic between the two islands. However the research undertaken demonstrates the viability of this project for countless routes across the world, routes suffering similar swell conditions as the Indian Ocean route.